Welcome to the Math Salamanders Math Fact Games for Kids. Here you will find a wide range of free printable Math Games to help your child learn their Math facts. Using games is a great way to learn Math facts and develop mental calculation skills in a fun and easy way. Children will pick up a whole range of skills through playing games naturally and informally. Encouraging your child to play math games and puzzles like sodoku and chess will also help develop their logical reasoning. Using these math games below will help your child to develop their Math fact skills as well as their strategic thinking and memory skills. Have fun using these free Math Fact Games...we hope you enjoy them! 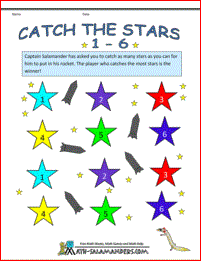 Catch the Stars is a set of Math fact games which uses dice rolls to make different numbers. For all of these games you will need at least one die, and some counters. 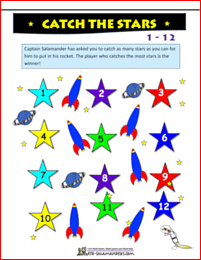 The aim of the game is to use the numbers on the dice to catch as many stars as possible. Learning skills: matching the number on the die with the number on the board. Learning skills: using different operations to make numbers to 12 with 2 dice. Learning skills: using different operations to make numbers to 20 with 3 dice. Learning skills: using different operations to make numbers to 25 with 3 dice. This Easter Egg game is a dice game that using rolls on the dice to make different answers. The winner is the first player to complete their egg! For this game you will need some counters. Learning skills: add and subtract (plus optionally multiply and divide) with numbers from 1 to 6. Operation Salamander is another dice game that uses die rolls with operations to create different numbers. It can be played on many different levels, from quite young children and upwards. Learning skills: using different operations to make numbers to 100 with 4 dice; adding multiples of 10. 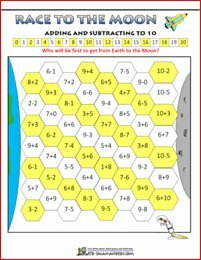 Race to the Moon is a series of Math fact games that develops rapid recall of Math facts. It is a simple game to play, and only required different colored counters. For this game you will need 2 dice, and some counters. Learning: adding and subtracting to 10. 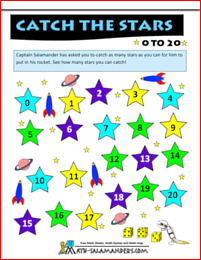 Learning: this game develops quick recall of the multiplication facts to 10x10. Learning: this game develops an understanding of negative numbers to -10. 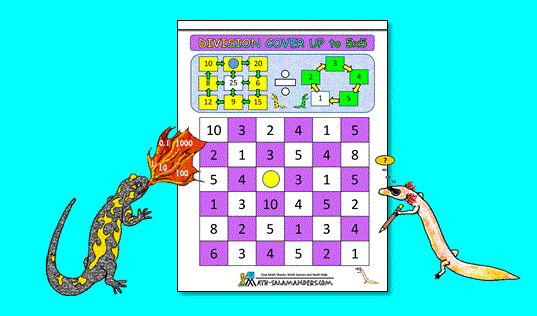 The Salamander Big Multiplication Game is a strategic game designed to practice multiplying by multiples of 10. The aim of the game is to get 4 counters in a row. Learning: multiplying by multiples of 10. Playing games with dice is a great way to develop your mental calculation skills in a fun way. These games are all designed to support children with learning their addition, subtraction, mulitplication and division facts. Here you will find a range of Free Printable Addition Games to help kids learn their addition facts. Using these games will help your child to learn their addition facts, and also to develop their memory and strategic thinking skills. Here you will find our selection of number classification games. 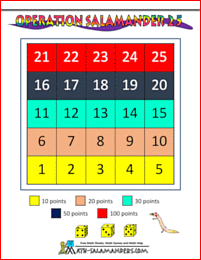 Each of the games in this section looks at different properties of numbers, such as odd and even, multiples and factors. There are a range of games are suitable for all ages, from kindergarten and upwards. Here is our collection of Math games involving strategy and logic for kids. All of these games are suitable for kids aged from Kindergarten and upwards. Playing games is a great way to practice math skills in a fun way. All of these games involve using some kind of strategy and logical thinking, as well as developing other Math skills along the way!